Meetings are held the First Wednesday of every month. All are welcome! Voting Members: Fiona Kerr- Chair, Jackie McGrath- Co Chair, Tania Zoldak- Treasurer (absent), Carey Burleigh-Secretary, Anique Robitaille-Dettbarn- Parent Rep(absent), Kim Daniel- Parent Rep, Stephanie Naval- Parent Rep.
Danelle presented programs offered for in school and after school programming for grades 1-6. Scheduled to work with St. Leo grade 8 students on photography project. Booked for Feb 2018 for Black History Month workshop. Council to consider partnership with Arts Express to create theatrical performance with St. Leo’s students. Voting Members: Fiona Kerr- Chair, Jackie McGrath- Co Chair, Tania Zoldak- Treasurer, Carey Burleigh-Secretary, Anique Robitaille-Dettbarn- Parent Rep, Kim Daniel- Parent Rep, Stephanie Naval- Parent Rep.
3. Attendance- See names above. Welcome New Parents! Alassandra and Tom presented both in school and on site programming: Offering a six day program with St. Leo Gr 8 students, focusing on photography and spoken word. Presented information regarding PA Day camps and free drop in programming. Invited to attend Curriculum Night on Oct 5th. Currently fully staffed, but will be working to reorganize classrooms to obtain appropriate class sizes. Will approach Mrs. Di Nanno re: student rep.
$2 agreed upon for civies day. See attached for additional events and facilities update. b. Building Committee , Lillian asked those involved in SARC Committee to participate in committee, there will be an opportunity to invite parents from greater school community as planning process continues. c. Paul Davis (Cyber Bullying/Internet safety presentation to students and parent) confurmed for May 24 grades 4-8 and June 19 presentation to parents. · Motion passed for CSPC to pay $550 rather than the prior amount approved for $450. b. Ms. Hunter will inquire to teachers if there are classrooms that would like to garden in tree planters again this spring. c. Ms. Ugrin asked that plants be replaced in the front planter box as most plants are damaged/ need replacement. MOTION PASSED for CSPC to pay remaining cost of $450. 6. Grade 6 parent has organized Pizza Day Wednesdays with Il Padre's pizza. Kym Daniels has volunteered to work with ME classes and EA’s to raise issues for students with Spec Ed Needs and deliver their concerns or needs to the CSAC. Ms. Arbor would like to be a part of the Planning Committee for the new building for accessibility purposes for her students. Teacher Appreciation Breakfast new people are volunteering to help out that morning. Can we ask MC to upload the handouts onto the website? How can we encourage parents to go to the website? Can teachers use apps to remind their parents about upcoming events? Direct notifications that inform parents to go to the website. There is a survey that will be shared on the website. In February they are finalizing the report so they would like parents to fill out the survey as a consultancy survey. Their goal is to raise French Immersion. The meeting was contentious because some parents were angry that their feedback was not taken into account. Asking why they would provide Immersion Programming instead of repairing school that needed repairing or that they wanted STEM programming instead. Parents were saying that they were not consulted. How do you ensure focus and equal attention to Immersion and Core students? How do we service both demographics with equality? They did not yet have best practices. Seemed like the TCDSB was trying to keep up with the Immersion Programming of the TDSB without having the same student populations. Fiona would like us to fill out the survey. The leaders of the OAPSI felt that they were losing kids to French Immersion to the TDSB. Tania raises a comment about the survey questions being misleading and information being missing from the Long Term Program Plan. Elementary Panel and a Secondary Panel found on the splash page on the TCDSB website. There is a Town Hall Recorded on Nov 24th. Late start for secondary and year round for elementary schools but these recommendations are not in the reports at all. The questions are in the survey but no information in the Long Term Program Plan. Looking at building another secondary school in South Etobicoke. There is specialized Sports Program. A Robotics Centre. Reggio Programming the Railway Lands School. Boundary Review Meeting will be at Christ the King on Dec 13th will be public and there will be a report released afterwards. Looking to move west to take some of St Theresa’s students. Discussed who we could hire to do the job. Could it be a team of volunteers? Brandi has a niece in a Master’s Program for Nutrition. Can we be their Practicum for the Master’s Students? Brandi raises the concern that there are still kids who are coming to school without breakfast or lunch. What is the plan for students who are coming to school hungry? Open fridge policy? Brandi has volunteered to shop and stock the fridge and would be reimbursed. For example, if you are on transit and you identify risky behavior, guns, knives, bullying by someone with a TCDSB uniform you can send reports. Meant to be a tool to prevent bullying and any inappropriate behavior. Welcome to new parents, Paulina and Stephanie. -$2 to wear Blue Jays gear on Friday October 14th. -Basketball beginning, parents volunteers needed. -Discussion held regarding recruiting parents for sports and other volunteer initiatives, Fiona to write email to parents to clarify time commitment with regards to each call for volunteering in an effort to make volunteering more feasible to parents. -Ten students volunteered to provide childcare during curriculum nights. Motion APPROVED for CSPC to give $150 to match Lillian for gift cards as payment for services provided by students. -short of about five volunteers, Fiona to put a call out in newsletter asking for parents to volunteer from 930-1030am. -Gloves/Garbage bags needed. Brandi to reach out to Councillor Grimes office to ask fordonation. -Motion APPROVED for $200 for supplies if donations cannot be secured. -Reported that Michelle is planning on delegating to the board in November to thank board members for working with CSPC in obtaining a new school. -Motion APPROVED for $150 to reimburse Michelle for purchase of coffee urns/coffee. -Dance a thon: April 21 or April 28, 2017. Jasmine Denham from The Stop agreed to host at no cost. Carey to follow up regarding dates. -OAPCE discussed: Bylaws state a member must attend OAPCE meetings, and each CSPC to have a voting member with an interest in special needs. Not having such a voting member, St Leo’s keeps a focus on children with special needs as well as all children from difference cultural backgrounds, OAPCE aware these needs are discussed during monthly meetings. -Reviewed request from parents regarding daily announcement made to recognize St. Leo being on First Nation lands. -Brandi discussed idea to produce a play celebration history of school in lieu of Spring Concert in June. **All Committee Members, please bring approximate budgets to November meeting. -Concern raised regarding occupancy of Kindergarten yard. Currently there are 90 children playing in the designated area at each recess. A request was made to Lillian to investigate occupancy limit for the fenced play area. 2. Rotate taking a group to an alternate play area? -Pizza Day: Currently no volunteers to run pizza day. Perhaps a call for volunteers to run program for one month at a time may recruit volunteers. Dear Lord. We thank you for the many blessings that you have bestowed on our school community this year. We thank you for giving us the courage and strength to make our ideas a reality and for the grace of rising above criticism to create a positive tide of change. We thank you for the love of our children and families and for charitable hearts for those among us who might be struggling or facing challenges, and the character to be fair and consistent leaders. While the jobs and commitments have been many, please help us to remember that the reason we do it is for our children and our community. Let us know in our hearts that the validation and accolades come in knowing that we have served you and that we have been examples for our children of what it means to be contributing parents and Christians. Dear Lord please bless us as we head into these summer months. May you keep our children and families safe and healthy and may we all leave today with joy and pride in our hearts for a year well done! We ask this in your name. St Leo pray for us. • JKSK will include a religion comment and no check marks will be included to determine the progress of your child related to the curriculum. • Grades 1 to 8 will receive a full grade for all appropriate strands and subject areas as well as a Religion/Family Life comment. No other subject comments on your child’s learning skills achievement will be recorded on the report card. • Teacher will not sign report card, however, the school principal will continue to attach their signature as usual after his/her final review. • Primary & Junior Teachers meeting on May 24th with Math Resource Teacher. Discussion: Next year continuity with our initiative. • Our school focus has been problem solving skills using math journals, group work and bansho strategies for students to discuss their thinking, illustrate their work (primary grades) and demonstrate their solutions of word problems via math literacy strategies in math journals. • Student questioning and explaining are important for developing and consolidating students’ thinking and understanding. Goals: Students to share thinking aloud solving a math problem. Safe Schools • We continue to be vigilant during the warm summer weather. • Visitors are required to buzz into the school office to gain entry. • Staff advised to not allow visitors to “piggy back” into the school with them. • Students do not allow entry visitors! • New admits to St. Leo CS - What happens in September? • Education Week Activities – a variety of activities. • Athletics Rep meeting in September. • St. Leo CS will sign up for a variety of sports. • Between the Board, School and CSPC funds, all classrooms are now very close to being technologically current (new ipads, new laptops, working desktops, ipad charging stations and smart boards). • CSPC has funded new athletic and gym equipment including a new scoreboard. • CSPC has funded $400.00 to every teacher for upgrades in their classroom and the cost of one bus for a school trip. • CSPC continues to improve upon our outdoor classroom with a blackboard, shade cover, food and flower plantings, new garden beds and tools for a greener St. Leo. • CSPC has paid for performing arts performances for the cultural benefit of all students. • CSPC supplemented the cost of the Nutrition program in support of healthy bodies and minds. • CSPC has supplemented funding for swim team and track and field, with additional funds for the Sport and Wellness Committee to improve athletic participation and performance. • CSPC has designated funds to supplement celebrations for religious sacraments and graduations as well as in school religious retreats. • CSPC has provided a Staff Appreciation Breakfast, and supplemented funds for Carnivale and Pancake Tuesday. • CSPC continues to update the skate locker so that all students have the opportunity to learn to skate. • CSPC donated money to the Syrian Refugee Committee. • CSPC organized a community carousel and funded a parent guest speaker at the Curriculum Night. • CSPC has purchased core items such as tables, awnings, volunteer aprons and hats that are used by the students at sporting events and at our major fundraisers. • Kids are invested and engaged in the gardens which had a domino effect on the teachers’ enthusiasm. All is going/growing well. • The schedule for the summer is in place. Carey will revisit the double watering requirement for the summer and let the volunteers know. • CSPC is thinking about putting more of an emphasis on sports next year. • We will need to re-evaluate hockey in September once we know what teachers will be available. We will also need to engage some parents. • Brandi noted it was another successful year with sponsors. Sponsors are happy. However there are likely latent opportunities for both the sponsors to make the most of their sponsorship (opportunities to bring more business in by optimizing the use of their sponsorship) and for us to collect more sponsors in the future. The more people soliciting sponsors in the future – the better. 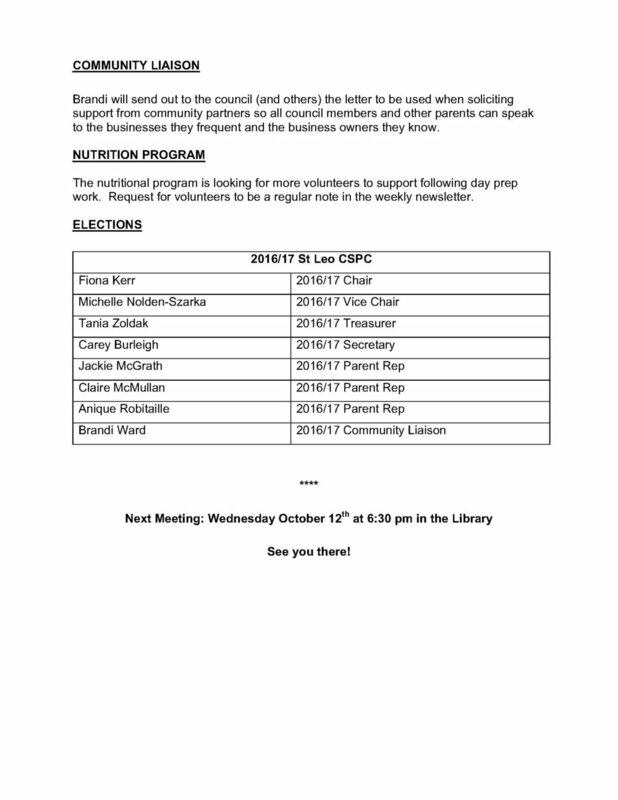 • The nutrition program will likely needs some support from CSPC for next year. • Claire is considering holding a dance/fundraiser for the older kids in the fall, to fund their use of the food program given these grades don’t contribute much to the costs of the program. • Carey shared information about a school in Honduras which could be an opportunity for the St Leo community to support next year. The school is set up to train students for the hospitality industry. The school is lacking in most things and any support would be useful. • Tania noted that in Canada there are also a number of impoverished schools (northern native schools for instance) so we could additionally look at needs here when considering donation potentials in the future. • Richard Kim joined the CSPC meeting to share with us the spirit wear his company can provide. • A website would be built for St Leo’s spirit wear. His team bears the cost of setting up and running the website. • The school can decide what items to offer – thereby deciding the price points and the possible margins. Mr. Kim’s margins are built into the costs to us. →Note that decisions for Spirit Wear do not go through CSPC. Decisions for and profits from spirit wear go through Mrs. Ugrin. • Mrs. Ugrin suggests setting up a stand in the library at Curriculum Night (September 29th 6 – 8pm) where parents can become familiar with items and place orders if they choose. Parent volunteers will be required that night. • St. Leo's school celebrated Earth Hour on March 11 by shutting off all electricity for one hour. We hope that this will help to save the environment one school at a time. • On March 17 we were allowed to wear green clothes for Saint Patrick's Day and we also played "Lucky Leprechaun bingo". • The school went to St. Leo Church on March 21 for Mass and for confession. • On March 23 St.Leo's school saw a performance by Ms. Lehane's Grade 7 class. It was an interpretation of the Stations of the Cross for Easter. Her class also did a virtue assembly about forgiveness on April 4. • A number of students participated in a chess tournament hosted by at Monsieur John Corrigan School in Rexdale. Congratulations to the St. Leo's chess team for having a number of students place in the top 5. • Congratulations also to the St. Leo's swim team. On April 2 there was swim meet at the Etobicoke Olympium. We have bronze medal winners this year. Aidan, Hope, Tony and Grace swam in the Mixed Relay and won bronze, Alex for the Breast Stroke. Thank you for the teachers and dedicated coaches who helped this year's swim team. • Well represented by eager swimmers at the meet. 2016 – 2017 The process has begun! Academic Report Primary & Junior Teachers meeting with D. Yack on April 18th as part of our school learning improvement planning during academic year. Our school focus has been problem solving skills using math journals, group work and bansho strategies for students to discuss their thinking, illustrate their work (primary grades) and demonstrate their solutions of word problems via math literacy strategies in math journals. Students to share thinking aloud solving a math problem. Students to be proud to share their work with the class. Students to practise sharing their reasoning with classmates. Mrs. Ugrin has been authorized to allow children into next year’s Grade One immersion class that have no previous immersion background. This is a one-time event while the immersion program is growing. Might this be an opportunity to get some of this year’s Grade One’s into the French Immersion Program? →Michelle to follow up with Doug Yack. We may have to delegate to the Board. Senior Faith Day will be on May 6th. →Fiona to find a flutist for Senior Faith Day. $100 honorarium approved for flutist. • We will be starting track and field practices next week. We have lots of teacher volunteers and all events, except for high jump, will be covered. • We ask that the CSPC Chair attend the upcoming “Welcome to Kindergarten” event. →Motion to approve expenses for this event, if they are not already covered in the Religious Committee’s budget. Approved. • The cloth scoreboard has been ordered and will arrive shortly. • Mimico hub meeting took place today. • TCDSB appear to be fully behind us getting a new school. • Ministry is giving priority to projects that are collaborative. • It would be helpful to get the TDSB on board to do a joint venture for the hub with the TCDSB. To do this it would be helpful to grow support for this with John English parents … they need to lobby their trustee. • Looking to meet with John English CSAC to show what we have done over the past year and where we are at today. →Motion to purchase another garden hose - $180. Motion approved. →Motion to purchase a rain barrel. Motion approved. • OAPCE Conference is on May 6th and 7th and OAPCE Toronto will cover the registration of two St Leo parent representatives. Anyone who is interested can sign up on the OAPCE website. • Met with LEGS who will plant raised gardens. We have applied for these planters and if approved, LEGS will set up these raised gardens – provide the planters, the soil, etc. We will be responsible to tend the gardens. • Ms Lehane is growing seeds in her classroom for the garden. • Five teachers have signed up for their classes to take care of the tree planters. • We are proceeding with Stewardship Plan shared with CSPC in January. Putting together a greening committee with kids and teachers and parents. The Lakeshore Syrian Refugee Fund has received the $500 raised from the dance-a-thon. Hail Mary full of Grace, the Lord is with thee. Blessed are thou among women and blessed is the fruit of thy womb Jesus. Holy Mary Mother of God, pray for us sinners now and at the hour of our death, Amen. • Since removing some of the excess sand (last Friday), the problem of sand in the classrooms has diminished. • Additional steps have been taken to reduce the sand in the classroom. There is a rotation of grades who get to use the sand each day, and buckets to dump sand from shoes have been placed in the hallways, and a review of sand play expectations. • Suggestion that children clean up their own sand (around their desks) with sweeping brushes left in the classroom. • Working on getting the children to feel a sense of stewardship for their sandbox. • Suggestion that the Grade Ones teach the Senior Kindergarten children the rules of the sandbox prior to them graduating at the end of this school year. • Sand toys arrived and are now in use. • Most of all, the children love the sandbox and the sand play has added tremendously to the outdoor play of the primary children. • Dance-a-Thon – C. Burleigh/J.McGrath THANK YOU! • Shrove Tuesday – Delicious pancake, fruit, juice treat for our students! • Mardi Gras/ Carnaval Activities – THANK YOU H. Simas, C. Hunter,C. Piwowarek,. Excellent selection of activities for all grades enjoyed by everyone! • Training on Friday mornings and Saturday afternoon. • CONCERN: Sand in the Primary Yard brought into the classroom on students’ shoes, clothing, hair etc. (a) Father Frank’s communication sent home regarding First Communion and Confirmation. It is mandatory that ALL families register ASAP with Father Frank. • There is no treasurer’s report at this time. However, it is noted that changing signatures at the bank is very difficult. Overall the council is concerned with TD Bank and its customer service and practices. • The Council will stick with TD at this time, but will revisit banking options once the TD Grant reporting and duration is complete. • Ms. Arbour has expressed an interest in greening. Carey will follow up with her. • Claire McMullin suggests looking into programs run by Ontario fisheries. They have programs to work go into schools and work with classrooms to discuss such things as human impact on our water resources. Carey will look into this. • Not ECO related, but Carey notes that we now have a Facebook page and it would be great if everyone could go in and “Like” it. • Father Frank is not mandating anything when it comes to gifts for recipients of first Holy Communion and Confirmation. Therefore the committee is looking at a number of options and will leave it up to the teachers to decide what they would like. • We have decided to split the auction out of the Spring Fling. We feel that last year the auction was lost in the activities of the Spring Fling and we likely did not get the full fundraising value from silent auction. • The auction will take place on April 16th at the Maple Leaf House. We will use an auction provider for the event. They provide items for which we will get 25% of the proceeds with 100% of the proceeds for whatever we collect ourselves. • Everyone to solicit auction items. • April 16th is the evening before the Confirmation so a great opportunity to include family who are coming from out of town. • Tickets for the event – current thinking $15 for 1, $20 for 2 ($10 each for other multiples). • Tickets with cover appetizers and the DJ. • What do staff and students still need? • Miss Hunter recommends a new scoreboard and a ball pump. • As for technology, there is no new request at the moment. Mrs. Ugrin suggests that the staff and students use what they now have and then later in the year we can revisit where we are at. • We have covered most things in the 20/20 vision document. One thing that has not been addressed is a school play/musical. Once we have reviewed our budget status, we will review what funds would still be required and look also at what grants might be available to get this started for school year 2016/17. • The number of students participating in pasta have been dwindling over time. On average we have about 70 kids participating. As a result, going forward, we will continue with only one pasta day per month – on the last Thursday of every month. • Will offer the option to pay once for the remainder of the year. • A note will be included in this week’s Sunday newsletter asking any parents who are interested in helping influence the Board to bring Extended French to St Leos to let us know so we can put a working group together. • At a later date – we will plan a meeting with Superintendent Yack and CSPC to discuss this matter further and consider next steps. Generous and loving God, You call us to be disciples of your son Jesus and good stewards of all your many gifts. Transform us through the power of your Spirit to nurture a stewardship way of life marked by faith-filled prayer, service to our neighbor and generous sharing. Teach us to be faithful servants of your gifts. With Mary’s help, may we return ten-fold the gifts entrusted to us. Bless our School with a deepening devotion to prayer, a growing commitment for service, and increasing levels of generosity as we work to advance the mission of both our School and Parish. We pray through Christ, our Lord. Amen. Going forward there are many grants available for health/diet in the school. The applications are done at the beginning of the year, with the funds coming soon after. The CSPC should be aware of these deadlines to make plans for other wellness related programs for next year. Other possible programs include - healthy eating programs with older students (not one day – program over time), balanced meal discussions. All are meant to get kids talking about food and making good choices. CSPC Chair will add note about the wellness day to the newsletter the week before it takes place to inform parents and start the conversation. Student rep present, Ronan Cantlon, noted that the students enjoyed the karate demonstration and the smoothie workshop last year. • SARC – Diligent and committed approach to bringing issues of the physical plant (building) of St. Leo CS to the attention of the school communities within our superintendency. • SARC members Michelle Nolden-Szarka and Brandi Ward will delegate to the Board on January 21st at 7:00pm. • Thank you CSPC for Teacher Appreciation Breakfast! • Cardboard Boat Race Grade 7 (Ms. Lehane). Children came in 4th out of 21!!! • Ms. Leblanc’s chocolates fundraising activity raised ~$5,000. (3) School yard check 3:30 pm to 3:45 pm; Three Educational Assistants will check the schoolyard to ensure “NO child is left behind”. (1) Next Mass will be held in the school gym on Wednesday February 17, 2016 at 9:30 am. All are welcome! (2) Father Frank’s communication sent home regarding First Communion and Confirmation. It is mandatory that ALL families register ASAP with Father Frank. • Thank you to Edge Imaging for “ED” the safety guy/ signs on Stanley Ave.
• Term 1 requirements completed! • Email Addresses for electronic school communication 2015 - 2016 – Completed! • Remembrance Day Assembly – November 11, 2014 at 10:30 am. • Virtue and Awards Assembly on November 27th at 1:00 pm. • Deposit is on hold because some data is missing for people who need tax receipts. Totals will be available for November statement. There is close to $5K to deposit including Clean Up Drive monies and $2.5K from The Rec Room. • Sent emails to all teachers who have events/sacraments this year to collect their feedback on the support they need. Have heard back from some, waiting for others. • Congratulations to Lillian on her Principal of Excellence Award! • Carey and I will follow up on what we need for the TD Canada in terms of photos for their website and the grant requirements. Does Lillian have the photos from Edge? • What is the swimming update? • We need to set a date for the Teacher Appreciation breakfast. We would like to suggest the 16th of December? Date agreed. We will need some parent volunteers. • We will add middle French immersion/Extended French to the January CSPC agenda and plan to have a strategy meeting about this topic. Mlle Hunter to follow up with the responsible TCDSB to get some guidance in advance of January. Prayer for Catholic Education - O, Holy Spirit, source of truth and grace for those entrusted with the Christian development of children, enlighten our minds, strengthen our will, fill our hearts with generosity so that our homes, our parishes and our schools may co-operate effectively with You, and with one another in the mission of Catholic Education. We make our prayer through Christ, our Lord. Amen. · CSPC & Principal Workshop at CEC October 14, 2015. Fiona Kerr will attend and agrees to be St Leo’s OAPCE representative. o Work in progress: Painting and Flooring in Rooms 233, 234, 235, 203.
o Nutrition Program. Claire MacMullan is planning to incorporate nutrition and cooking lessons for the older grades. Proposal in works. Information to follow at a later date. o Lockdown Drill will take place on Thursday October 22 in the morning. § Ms. LeBlanc’s Chocolate Fundraiser will raise additional funds for the purchase of technology in the classroom. Ms. LeBlanc has offered to fully organize the entire process! o The first virtue assembly of the New Year was held at the end of September. The Grade 8 class used prayer, skits and 21st C technology to enhance their presentation. o October 19th – Clean up Drive. Chris Szarka will be MC. o These suggestions by Mrs Ugrin were received well. o Claire Michaud an event planner and St Leo parent has volunteered to support some fundraising events. These could be appropriate activities to include her. Michelle to follow up with Claire. o The Safe School Fund which was maintained by Dianne DaLuz had an opening balance for this school year of $2600.00. The ledger is available. o Confirm if Ms. Lehane received payment from the board for her receipts last year. o What day is good for Ms. Lehane’s last year class to have a pizza lunch? Suggestion that CSPC put $6000.00 to this wish list. This does not include the ear marking of funds for our Spring Fling. The suggestion is that the sponsorship dollars which will be arriving in the next few months be for this purpose. The suggestion is also that incremental costs for fundraisers be on a project by project motion/approval. This leaves us with a working balance of $1233.08 with a mid-year budget evaluation in February. Awaiting approval on ProGrant for Curriculum Night. The monies included in the budget do not include donations that have come in since September via sponsorship program, Rec Room donation, Remax picnic table sponsorship, etc. Keep swim team allotment as is ($650.00) – but propose fee for students joining team to be raised from $25.00 to $50.00. Letter will be sent to parents. Suggestion that kids try out and then safe schools can supplement any students who might find the fee too much ($50.00 might deter students who would really benefit). Currently no pool has been found for swim team practices. This proposal will be revisited when pool has been secured. Suggestion that same protocol be followed with Hockey team. Religious and Social Committee allotment to be raised from $1500.00 to $2000.00. Grade 8s to be made aware that they still need to fundraise for their activities. In this regard, Mr. Punter has been asked to put together a fundraising schedule so as not to overlap with other fundraising activities. Principal’s wish list – CSPC to put $6,000 towards wish list, Mrs Ugrin to cover microphones and Prologue for the Performing Arts within the school’s budget. Funds for pasta lunch honorarium confirmed. To revisit in February. Michael to give deadline to teachers for receipts for $125.00. Motion to provide a $100 Best Buy card for highest student fundraiser (Cleanup Drive) and $100 for ‘House’ that collective raises the most money. · We will be seeking donations of baked goods for the Unveiling reception as well asking parents to “lend” us their fall flowers for the day. Volunteers are needed for the unveiling and particularly with setting up the reception in the gym. · We are also looking for volunteers to help on the Cleanup Day. Unfortunately, I will to be unable to attend either of these events as I have a work conflict and am hoping some other parents might be able to step up to help Carey on the day for both of these events. Chris Szarka will be taking my place to lead the Cleanup Day. · Possible fundraiser for the school between Amazon, Spinmaster toys and Fifth Ground Entertainment. Spinmaster has done a series of Internet teasers for their upcoming toys. Michelle and Brandi have both directed some of these and can speak to the professionalism of all companies involved. $1000.00 would be donated to the school and $25.00 will be donated for each child who auditions. Not all children will be chosen to audition as the requirements from the company are particular in terms of age range of children as well there is no guarantee that every audition will be used in the final commercial. o A consent letter will be sent home with the children as well as the age ranges that the company is looking for. · We have had a parent who has expressed some concern over the sandpit and the amount of sand that is being brought home in pockets etc. Suggestion that perhaps we purchase a few sand brushes that can be chained to the fence that will allow children to brush the sand off of themselves. Michelle will price out. There is a link on the website under EcoTeam that outlines the benefits of sandplay as well as the exact materials used, recommendations of the TCDSB and the benefits of granitic sand.
. Watering needs to continue until we are in a consistent frost. Looking for volunteers. · Call again for parenting books and resources – either second hand books or recommendations for CSPC to purchase for our Parent Resource Shelf. · Call went out today for used sand toys and items for the FDK yard. Very hard to find sand pails and shovels at this time of the year. · Update on SARC is that there is no update. We are no further ahead than before the last meeting but remain steadfast in our recommendation of a new school. · We will be sinking the pole for the tarp this weekend. Wondering what Dads are available to help Chris and what day might work best for everyone? o Planning agenda for unveiling event. o Will need baked goods from parents. o Sue is moving out of the area and so we need a replacement for her as Committee Head. CUPE UPDATE CUPE, representing education workers including custodians, school office staff, educational assistants, child and youth workers, has escalated ‘work to rule’ job action. Thanx to your hard earned fundraising dollars and support, 2014/15 has been an exciting year at St. Leo’s with only more good things to come. Please know that as your council, we aim to offer inclusive and fun ways for you to get involved in your children’s education while improving our school environment. A special thank you to all parents and families who have contributed to CSAC and Fundraising Initiatives and to those of you who have volunteered time to make them happen. Please find the following for your information. If you have any questions regarding allotment of CSAC funds, transparency or ways to get involved please don’t hesitate to ask. *Between the Board and CSAC funds, all classrooms are now very close to technologically current. (new ipads, new laptops, working desktops) Emphasis for the remainder of the 2015 school year will be on gaining proficiency on our new technology. *Wireless connections have been and continue to be installed. *Apple TV and new Television for Library to make it technology hub for school. * $850.00 to the repair of our Musical Instruments. *CSAC has funded the cost of one bus per classroom ($254.66 each) for a cultural field trip. * CSAC has funded $150.00 to every teacher for upgrades at their discretion for their classroom. * 13K has been earmarked for greening of our school yard and outdoor classroom - to be done Summer 2015 (Total estimated cost 70K) CSAC has applied for numerous grants. * CSAC and specific parent donations have improved the school yard with murals, planters, kindergarten mulch box and music wall, shrubs and flowers. Additional CSAC funded murals are being done currently in classroom. * CSAC has supplemented cost of Rob Matejka art project to be installed in Spring 2015. * CSAC has supplemented funding for swim team, track and field, and chess team with additional funds for the Athletic Committee to improve participation and performance. * CSAC has designated funds to supplement celebrations for Religious Sacraments and graduations. p. Letter from Director – Angela Gauthier sent home today. v. Organized by M. Lehane and S. Muller for south Etobicoke schools. jj. Junior & Intermediate - Students at recess times will be allowed entry into the building by teachers on duty; using card entry system. kk. Primary students will be walked to the entry doors to access facilities; door monitors will allow access at this entry point. ss. Mrs. DaLuz and Student Leaders will be organizing a fund raiser for Nepal Earthquake victims. Hot Dog sale is being discussed. tt. (CLUBScontinuing . . .
c. Lillian to submit bills to Michael for buses. APPROVED MARCH MINUTES prepared by Secretary Pavla Cervak. Lord, we are meeting today to conduct matters of business. Guide our hearts and our minds in the spirit of fairness, right thought and speech. Impart your supreme wisdom upon our activities so that our affairs may reach a successful conclusion. Thank you for being our source of guidance today. 3. KNIGHTS OF COLUMBUS FREE THROW FINALS - St. Leo will be represented by 4 students Ivan Moreno, Rej Dekaj, Jamie Medieors, Jonathan Medieros. 6.PHYSICAL PLANT UPDATE– New electrical wiring completed on the hallway TV! Grade 4/5 students; more classes to be involved! Will keep CPSC informed of changes. Currently: Mrs. Martinez is on leave. Posting has taken place. Mr. Mendonca has accepted a full time position. Posting has taken place. (3) Jump Math Program is being piloted in all grades 1 to 8. Teachers have been in serviced. We have selected internal/school based professional development for teachers to assist with this implementation. Our Superintendent of Education has approved a supply teacher to cover Ms. Lehane as she provides a technology in service to teachers; demonstrating grade appropriate applications of the Jump Math program. • TECHNOLOGY SUPPORT – See above. Student Leaders & Mrs. DaLuz will be embarking upon a new project in the Spring. 2. Instrumental Music Repairs have been completed. • REQUEST OF CSAC - It is time to begin preliminary discussions with a view to prepare a Parent Handbook. Responsibilities: Contact multiple cultural restaurants, sell advertising/sponsor package and invite them to sell their food at the event. Order Pizza and manage all tasks relating to Food on the day. -Contact past vendor/artisans to participate again. -Contact and manage all current sponsors and make arrangements for them to have a table in the vendor market. -Handle the collection of all funds for all participants. Order rental tables if necessary. -Arrange for Entertainment ASAP (Cultural Themed/ Main Attraction and Filler Acts) *Possibility of using Cultural Money/ parent involvement funds to pay for quality main act. -make arrangements for generators/sound system, MC and DJ for the day. -Manage all things relating to entertainment on the day. -Make arrangement for each location to have a collection boxes so that tickets cannot be recycled like last year. -Three weeks prior and every week until event --Contact Church to arrange for both announcements and advert in bulletin concerning bake sale donation requests/drop off location etc. 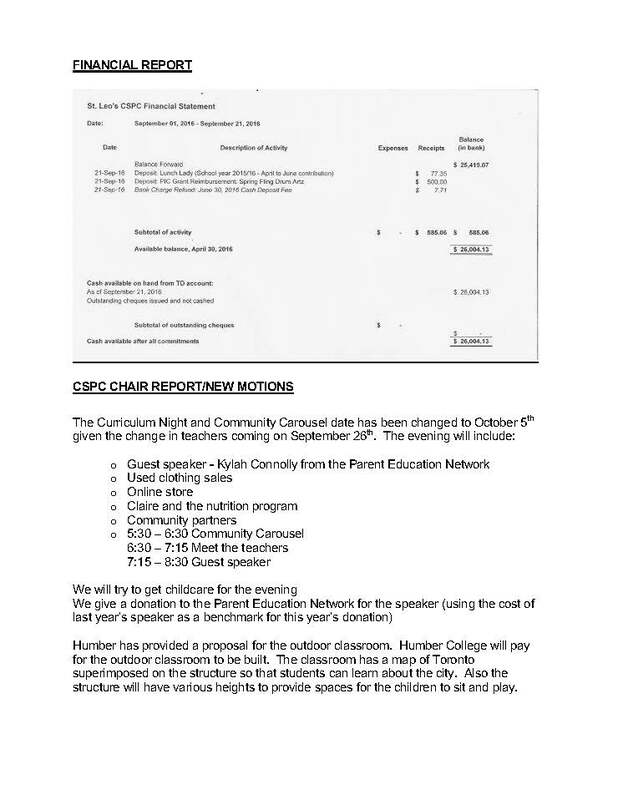 Our name has changed CSPC – Parent Council seems easy. Pro Grant application is May 19th. We need to consider what we might like to use this funding for. Curriculum Night – want to make it a real source night for the parents. We currently have 40 skates in our skate locker. Would like to pass a motion to purchase four of the wide bins – total cost is $113.00 for storage of the skates and helmets. These bins are all extra-large or same size, look very professional and allow us to organize the locker very easily. Skates will remain at the school locked in the CSPC room and a CSPC member must sign them out. Helen second the motion and all approved. Thank you to Lillian for organizing the Math Night. It was a really fun and well run night. Hopefully next year we can have more parent engagement so if anyone has any ideas how to reach our parents better - please let us know. Ms Ryan has requested help in cataloguing books on Monday mornings from 9:15a.m. to 10:30a.m. It is just a matter of putting the bar codes on and stamping the books. We are need of volunteers for the swim meet this weekend. We are also in need of volunteers for the 6, 7 and 8 skate day. Thank you for everyone’s encouragement on the website. As Brandi can attest to I have never been the most computer savvy person so I am feeling quite proud about the website and can actually say I really enjoy doing it. It is very easy to do and to navigate. I am happy to maintain it and it is much easier than the school portal. It is a cost of $8.00 per month. We would like to start a group for folks who are interested in Curriculum Night for September. Next Meeting scheduled on May 6th, 2015 at 6:30 pm in the Library. Minutes prepared by Secretary Pavla Cervak. O, Holy Spirit, source of truth and grace for those entrusted with the Christian development of children, enlighten our minds, strengthen our will, fill our hearts with generosity so that our homes, our parishes and our schools may co-operate effectively with You, and with one another in the mission of Catholic Education. We make our prayer through Christ, our Lord. Amen. Strategy for follow up. Be sure we are including Lillian so we can work together. Increase social media – perhaps a dedicated parent, media team, linking with other committees. Fundraising mission statement that highlights we are providing experiences for the ENTIRE school and that EVERYBODY benefits when all participate. Focus on community outreach, inter-generational relationships and student leaders. Explore professionals to come in and supplement our Teacher Coaches. To create a Heritage Committee that celebrates the diversity of our school. To engage more ESL and parents of different ethnicities to come to meetings and volunteer. Perhaps designate a job position to provide for hot lunches. To create website and possibly face book page. Claire McMullen indicated that John Tory has been invited to attend an assembly at the school May 7th. (2) First Annual French Café – a huge success. Lots of support from parents, staff and grade 8 students. Thank you Julie Stone, Claire, Michelle, Fiona, Giovanna, Michael, Aaron, and Mira. (3) French Immersion Program for September 2015. (4) Physical Plant update – New Digital Wall Clocks are being installed this evening. Religion/Faith Announcement from Father Frank: First Communion and Confirmation Registration - Everyone must register! Call Father Frank! A request has been made to make functional the school’s snow blower in order that caretaking staff may use it to clear a path to the main door. Expenses: Screen to be paid $ ____________? Parent Teacher Interviews will take place in the evening of February 12th and the morning of February 13, 2015. (2) The Grade 4 students will be completed the OLSAT assessment on January 28th. Traditionally this assessment is used to identify POTENTIAL candidates for the gifted program. If you wish additional information please contact Mrs. Ugrin. (3) Our Primary Teachers will be participated in a Literacy Inquiry activity on January 28th. Ms. Policelli was the lead presenter, and her students participated in a demonstration lesson. TECHNOLOGY SUPPORT – At present we are where we need to be! Looking forward to the installation of the APPLE TV and TELEVISION. In addition to TECH support for teachers and students, especially with the mini ipads. $10,000 from the ICON Homes donation has been earmarked for technology upgrades. REQUEST OF CSAC - It is time to begin preliminary discussions with a view to prepare a Parent Handbook. Helen and Tania updated work Plan. Contacted Father Frank and Frances. Sent email to teachers linked to activities and detailed what was to be discussed. Want to form a grad committee; however Tyler indicated that no committee will be formed. Michelle to follow up with Mrs. Martinez regarding skate night. Thank you to everyone for contributing to the 20/20 discussion. We will do an updated 20/20 plan and discuss the direction of funds based on our outcomes for our March meeting. A huge thank you to the Eco Team – Majesta and Tree Canada have been submitted. TD will be submitted on Monday. We are waiting for the New Horizons Grant to open so that we can apply for that. Lowe’s ToolBox Grant is not open to Catholic Schools. If anyone has any other grants that they know of that we can take advantage of – please let us know. Good presentation to the Board and due to our Family Math night we will not be presenting February. We will be showing our eco team video at the March Board Meeting and should know if we are finalist for the Majesta grant at that time. Arc Review – Does anyone have any questions? – Reiterate we have been assured it is nothing to be afraid of and that our greening plans will continueas planned. Winners of Marlies tickets as donated by Councillor Grimes will be determined by Ms DaLuz. Have been in communication with Maia Puccetti and Joe Couto regarding a new school sign. Typically this is something that schools raise funds for. They looked into getting an older one for us but there is nothing in the warehouse and the cost of removing one from an old school is prohibitive – must pour concrete footings etc. We are researching other options. Thrilled to announce that Islington Nurseries will be donating rockery for our outdoor classroom. Would like to put forward a motion that we cover the cost of the repair to our musical instruments from our Outside Agency Account. Next meeting on Wednesday, March 4, 2015 at 6:30 pm in the Library. Minutes taken by Co-Chair Brandi Ward. In attendance: Claire McMullan, Alison Juda, Michael Bock, Michelle Szarka, Susan Orr, Lillian Ugrin, Halina Simas, Joseph Dedeckr, Fiona Kerr, Brandi Ward, Jackie McGrath, Tania Zoldak. (2) Carey Burleigh for updating the flower box! (3) All Grade 8 High school applications were completed, received and submitted on time! (4) Remembrance Day Assembly was exceptional this year! (5) Successful Scare the Hungar Food Drive over 500 pounds of food donated! (6) Grade 1 students represented ST. Leo CS at the Toronto Police College – Super activity for our students! They participated fully in the investigative training process with the officers there. (7) Swim Team practices have begun! P I C funds of $500.00 are available to be used towards the purchase of materials and refreshments for this evening. Coordinator of this project is Melissa McGrath. • Tylr Curcic-Mackie and Ivan Moreno represented St. Leo CS at the recent Safe School Symposium. Mrs. DaLuz and Mrs. Curcic-Mackie supported our students! 2. Officer Rich keeps up informed about safety situations needing our attention. We inform students and staff via announcement to be safety aware and be mindful of personal safety at all times. • TECHNOLOGY SUPPORT – Awaiting the arrival of the iPads. • CLUBS continuing . . .
-CSAC offering to help safe schools with Holiday Donations re: clothing etc. -Discussion on Integrating uniform clothing swap into curriculum night next fall 2015. -Mass in the gym on December 3rd. -Grades 4&5 students presented readings- French students sang. -Sub committee- Michael Bock requests that each sub-committee leader forward any expenses in advance so that he knows what reimbursements will be coming. -Meeting with Doug Yack tomorrow with CSAC reps and Mrs. Ugrin. -Difference of $83.59 still to come from the visa machine. Tania is still working on it. Supposed to be completed tomorrow. -Discussion on the closing of the - long branch account. Claire, Tania and Michael. Goal is to have that completed as soon as the money is returned from visa company. -Discussion of the distribution to Icon Homes money. Lillian will be given the bussing money directly . Outside agency account will be involved. -Report on Pasta lunch success. -Report on advertising initiative. There are 14 local businesses now on board. -Advent mass celebration details. Debate on whether we are over taxing parents at this time. Event meant to offer service of an easy meal, inexpensive toys and family photos at a discount. -Much debate about how St. Leo’s gives back in the future. _When are the computers arriving? Many computers are slow- clarification on the process of ordering and arrival dates by Lillian. -Should we order computers now to get in the cue or wait until the next shipment arrives? -Motion to order computers now Brandi . Michelle 2nd ,Tania, Claire and Michael agree. Motion passed. -Skate night disucussed. $160 for ice time. Senior grades. Grades 6, 7 and 8’s . -Debate on how to properly engage older students in fundraising. Helmets required. How do we go about making sure that every student has a helmet for the date? -Motion passed to fund skate night. Motion 2nd and passed. - Discussion of French Immersion. Importance is that St. Leo students and Catholics in South Etobicoke are given the CHOICE for Immersion. Discussion not about validity of French as a 2nd language. Currently the only other languages available are through the Heritage Learning Program.